The National Science Foundation (NSF) has announced its first research awards under its Improving Undergraduate STEM Education: Hispanic-Serving Institutions program. Stan State will receive $1,462,263 to fund a program to develop inclusive and engaging curriculum and instruction, and boost achievement. “This grant will support STEM faculty in improving their teaching practices in introductory courses,” said Matt Cover, Stan State professor of ecology, who was the University’s principal investigator for the award program. With a student population that is slightly more than 50 percent Hispanic, Stan State is one of 120 public four-year colleges nationwide that has been designated as a Hispanic Serving Institution (HSI) and has been actively involved in recruiting students from underserved populations into STEM studies. “This grant was written and conceived by a big team of STEM and social science faculty, and will integrate with a number of existing Stan State programs aimed at improving student outcomes and advancing opportunities for faculty development,” Cover said. Just last week, Stan State received a $745,997 NSF award to fund programs and projects to provide educational opportunities for math and science majors pursuing a K-12 teaching credential. Stan State will be using that funding to underwrite nine scholarships, as well as to support campus projects and programs that will lead to a more robust and diverse talent pipeline of K-12 science and math teachers. Hispanics constitute 16 percent of the U.S. workforce, but they make up only six percent of workers in STEM fields. Congress directed NSF to award grants to HSI colleges and universities. This program is designed to invest in projects that build capacity and increase retention and graduation rates for STEM students at HSIs. 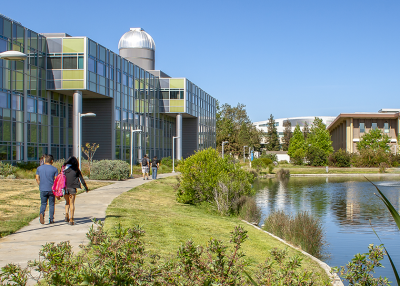 The NSF issued 31 awards nationally, totaling approximately $45 million, with California universities well-represented in this initial list of recipients. Awards also went to CSU campuses in Fullerton, Pomona, Sacramento, Northridge and San Diego. In addition, UC Merced received an award from this program, as did community colleges Hartnell, Los Angeles Mission and Riverside. One California private college, Dominican, also received an award.